The Hungarian low-cost air carrier Wizz Air will launch flights from Krakow (Poland) to Kharkiv a month and a half earlier, from August 2, 2019 (previously planned from September 16), according to the airline's booking system. Kharkiv-Krakow flights will be carried out on Mondays and Fridays (departure to Krakow at 17:35, back at 14:05 local time). As reported, Wizz Air is considering the possibility of resuming the work of the Ukrainian subsidiary Wizz Air Ukraine in 2019, and also plans to invest $2.5 billion by 2025 to increase the Ukrainian fleet to 20 new Airbus A320 and Airbus A321 aircraft. 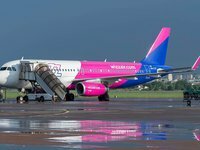 Wizz Air, the largest low-cost carrier in Central and Eastern Europe, offers flights on more than 600 routes from 27 bases, connecting 145 destinations in 44 countries. The airline's fleet consists of 89 Airbus A320 and Airbus A321 aircraft.